Current Services: Sundays at 8:30 & 11:00 a.m.
Bishop Dickie L. Robbins is a dynamic visionary and leader, public speaker, preacher, and teacher. His ministry has been impacting the lives of the citizens of Chester, PA and the entire tri-state area for over sixteen years. Bishop Robbins attended Earlham College in Richmond, Indiana until 1978. He has completed additional course work at several colleges including Indiana-Purdue University in Fort Wayne, Indiana, Saint Francis College of Fort Wayne, Indiana and the Center for Urban Theological Studies in Philadelphia, Pennsylvania. After completing course work at Eastern Baptist Theological Seminary in Wynnewood, PA, he went on to obtain his Masters of Divinity Degree from Chesapeake Bible College in Chesapeake, Maryland. While experiencing a successful career in Indiana, Bishop Robbins heard and responded to the call of GOD on his life to Pastor in the City of Chester. With his wife, Tina, and his faith to assure him, in 1985, he left Indiana and moved to Chester, Pennsylvania. 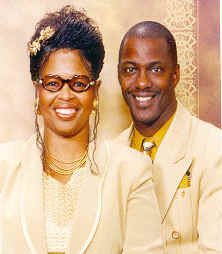 The two of them established what is now known as Life In Christ Cathedral of Faith - located on 3rd & Booth Streets in Chester, PA. Bishop and Lady Tina have dedicated their lives and service to the ministry of Jesus Christ for this age. They both are committed to winning souls for the Kingdom of God, equipping the saints for excellence in life and ministry, and restoring the solidarity of the family. Bishop Robbins and his wife Tina have three daughters, Donietta, Danika, and Dayonique. Upcoming Events: "Intimate Encounters with God"
The "Miracle Catch" is a banquet for men only - Bishop Flynn Johnson and Elder Yul Crawford from Atlanta Metropolitan Cathedral in Atlanta, GA will be our speakers. This fantastic event will be held Friday, April 16, 2004 AND IT'S TOTALLY FREE!!! A delicious dinner will be served for you and your guests and we'd be ecstatic if you could join us. © 2001, 2002, 2004 John A. Bullock III.